Departement of Vaucluse - Pop. 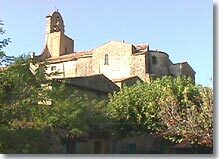 : 680 h.
Situated 7 km north of Vaison-la-Romaine on the D938. When you arrive on the road from Vaison-la-Romaine, the village comes into view perched on a rocky outcrop overlooked by the ruins of its chateau, destroyed in the Revolution. 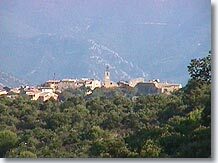 Puyméras is surrounded by beautiful countryside, alternating between lavender fields, cultivated land and unspoilt hills, with Mont Ventoux as a distant backdrop. 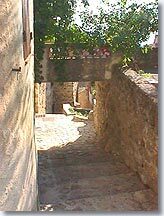 As you walk along the village's narrow streets, you'll discover beautiful old houses. Most of the shops are located at the foot of the village, in the Barris district. On your way, you'll notice the belfry standing proudly. A few steps away stands the Sabrun gate with its beautiful vaulting. 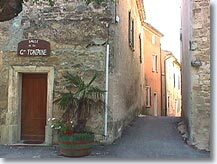 It is the old entrance to the village, and will bring you to the "Grand Rue" in the heart of the village. Watch out, it's quite a climb. Two stairways will help you reach the church and mairie. On this, the highest point of the village, once you've got your breath back you can take the time to enjoy a panoramic view of the village's surrounding area. Worth noting: Puyméras is unusual in that it produces an organic wine, sold by the wine co-operative. Three vineyards at Puyméras cultivate organic vines and bring their harvest to the co-operative. The organic grapes are left to macerate separately, and matured in the best possible conditions. 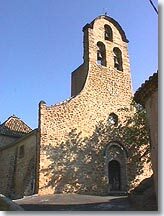 The Romanesque church of St Michel. Market every Wednesday and Saturday afternoon. Holiday rentals. Furnished accommodation. Gites. 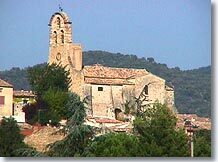 St Romain en Viennois (2km), Faucon (2 km), Vaison-la-Romaine (7 km).